A few weeks before the 4 March general election, the country is still dominated by a profound economic crisis and serious social consequences. On the political plain, the centre-right coalition of the Lega and Berlusconi’s party Forza Italia have returned to the national political scene, the PD is in a serious situation in the polls while the Five Star Movement (M5S) is basically holding firm as the main party. On the social plain, the retreat of the workers’ movement has continued in a scenario dominated, with rare exceptions, by the passivity and docility of the trade union leaders. In this context, the political debate has been dominated by two issues – immigration and security, shifting popular opinion on these questions to the right. This situation can only be understood however by starting from the political and organisational crisis of the Italian workers’ movement which remains one of the central elements in the Italian situation. A context dominated by the economic crisis, the absence of significant mass mobilisation, the retreat of the organised forces of the working class and the disintegration of the middle class is a potentially reactionary cocktail. On the one hand the shifting of the political discourse to the right leads to a legitimisation of neo-fascist organisations like Casa Pound and Forza Nuova, and on the other hand, the growth of aggression and real neo-fascist attacks such as that carried out by Luca Traini against black Africans in Macerata last week. In a recent poll, 74% of Italians thought that fascism was a real danger. Obviously today there is no immediate real danger of a return of fascism to power, but this poll is indicative of the perception of the threat of fascism by ordinary people, of the continuation of strong anti-fascist traditions among large layers of the working class and of an inevitable political polarisation which will develop in the future. The sad spectacle of the traditional parties has alienated millions of Italians from political engagement. Traditional politics seem increasingly like a great media circus in which the person who exaggerates the most wins and in which every basic element of coherence or honesty is trampled on. Matteo Renzi who wanted to abolish the Senate and promised to withdraw from political life if he was defeated in the referendum on constitutional reform (which he was), is leading the electoral campaign for the Democratic Party (PD) and is standing for the Senate! Maria Elena Boschi who wanted to abolish the regions with special autonomy status will be heading the list in Bolzano, which has special regional status! Salvini, leader of the Lega, is in an electoral alliance with Berlusconi who he said he wanted nothing more to with. Di Maio who was crowned as the young prince of the ‘anti-establishment’ ‘anti-political caste’ M5S flew to the City of London to reassure the financial markets about his responsibilty and declared that he was avaliable to form a government with the PD and Forza Italia. The ex-president of the Senate and leader of Liberi e Uguali (a ‘left’ split from the PD) promises free university education, the M5S promises a citizens’ income, Renzi economic growth, Berlusconi a minimum pension of 1,000 euros a month and (as he did 17 years ago) a bridge over the Messina straits! To many people it will seem very strange that Berlusconi , 24 years after his first electoral victory, can be a front-runner in this election campaign. In addition to being 82 years old and a protagonist of hard attacks against the popular classes, Berlusconi has accumulated a very long series of convictions for the most disparate of crimes ranging from financial fraud to sexual offences. His survival on the political scene can only be explained by the strong detachment felt by ordinary people towards politics and parties, by the catastrophic loss of support for the left (and more specifically for the PD) and by the absence of a credible political alternative fighting the Italian and European capitalist attacks on workers and young people. In the context of the anti-political mood that has arisen and the populism of right and left, Berlusconi has been seen by some as ‘responsible and presentable’. The same can be said for the European People’s Party that has recently showed wholesale support for him. But he also reflects the development of really reactionary and dangerous moods and movements in Italy. The hostility to the old establishment parties can explain why, nowithstanding scandals and clear incompetence the M5S is still ahead in the polls and projected to be the party that gets the most votes in the elections. The feeling of antipolitics and the distance that separates the common people from the palaces of power is such that it is enough to declare oneself honest to obtain support. The demand for something new and the anger against the government allows opposition forces to grow without moving a finger.The political programmes and the demands are secondary compared to the simple fact of being honest or oppositional. The authoritarian way the movement is run by the duo – Grillo and Casaleggio junior, the bad administrative management of Rome under the M5S Mayor, Virginia Raggi, the sacking of workers by the M5S municipal council in Livorno, become less significant in a situation in which the electorate consciously moves towards the ‘least worst’. Socially speaking, the fact that the M5S is clearly oriented towards the petty bourgeoisie in a situation in which it is suffering from a crisis that is not only material but ideological, explains the continuation of their success. It is not surprising therefore that the elections seem to be the last thing on many Italians’ minds. Above all the youngest electors (only one in two under 25s say they will vote) show little interest in the traditional political farce. And can we blame them? Recent governments were supposed to be a sign of renewal after the disastrous experience of the Berlusconi government and Mario Monti’s technocratic government. The defeat at that time of the centre-right and the growth of the M5S seemed to many to represent a sign of hope and optimism that would lead to important changes for ordinary people. But it didn’t work out like that. Within a few weeks of entering parliament the M5S was wracked by a profound crisis with splits, defections and betrayals. The absence of a clear class point of reference and attempts to bypass intermediate bodies and traditional tools of representation have produced a political party without a political line, without democratic structures and dominated via the internet by an obscure consultancy company, Casaleggio Associati. The M5S has been entirely absent from the point of view of social mobilisations. It has not called or organised strikes or demonstrations to protest against the introduction of the Jobs Act (labour market ‘reform’) or the Buona Scuola (school ‘reform’). Moreover, in a general climate of fear of worsening economic and social conditions, of anti-immigrant sentiment and general decline in consciousness the M5S has chosen to associate itself with backward moods and to feed the fears which sow divisions amongst the poorest sections of society. The PD, which failed to win a majority in the 2013 elections in which it was supposed to triumph, has had to change course. The traditional leadership coming from the Communist Party experience has been supplanted by a group of 40 year olds led by Matteo Renzi without any ties with the history of the Italian workers’ movement. Renzi’s conquering of the PD had led to the definitive assertion of a political line which is completely hostile to the interests of the working class. Traditional attempts at mediation between big business and the working class has been replaced by a pure and simple defence of the material interests of a section of the Italian bourgeoisie, the section mainly exposed to the international market. The first Renzi government clearly revealed this change of course with the introduction of severe attacks on the working class and the dismantling of its traditional defence organisations. This included the abolition of article 18 of the workers’ statute which was won by the Italian working class in the battles of 1969-1977. With regards to internal affairs, the PD has even gone beyond the hopes and expectations of the centre-right. The Orlando-Minitti decree institutionalises the systematic denial of basic rights for some citizens. The introduction of DASPOs, which effectively criminalise the homeless, is a horrible class measure that fights the poor and not poverty. Abolishing the second level of the legal process regarding immigration is a fundamentally racist measure which reveals a justice system that is characterised by the denial of fundamental human rights. As far as foreign affairs are concerned, Renzi and prime minister Gentiloni have also shown themselves to be loyal executors of the interests of the Italian capitalist class; the agreements made with Libyan clans to imprison Subsaharan immigrants and the recent decision to send Italian troops to Niger show how the defence of human rights is the last concern of a political class which lives on money and donations from the big economic groups like the energy company Eni, principal sponsor of the Niger operation. The attempt by Renzi and Gentiloni to distort the constitution in a presidential direction was decisively rejected by millions of Italians who were not dazzled by government propaganda and the hysteria of the bosses’ organisation Confindustria. It was a spontaneous and popular response to the government’s arrogance. The result of the referendum revealed to the government and big business the enormous gap that exists between ordinary people and the corridors of power. Politicians from all sides have clumsily tried to ride this spontaneous victory which came from below, including Bersani and D’Alema (an ex prime minister), who immediately after the referendum left the PD to try and restore their political innocence. Since it is impossible for the PD to claim to be a genuine left force a space has been created for the birth of a new political force which Bersani and D’Alema have created, Liberi e Uguali (Free and Equal). Notwithstanding the promoters’ attempts to present it as a new force breaking with neo-liberalism, this formation is composed of the main representatives of ‘left’ governments over the last few years. The attempt to rebuild the Italian left around personalities such as D’Alema, Bersani and Grasso, who have been compromised in every way with anti-working class policies in previous governments, can only end in total defeat. In this context the initiative by the the social centre Je so’ Pazz (ex-OPG, former General Psychiatric Hospital) in Naples to launch Potere al Popolo (Power to the People) is a brave and audacious attempt at rebuilding around an anti- neoliberal programme the principle of political represention for workers and young people and sending a message of hope and resistence to the hundreds and thousands excluded from traditional politics. For this reason Resistenze Internazionali (CWI Italy) has decided to affiliate and support this project in order to contribute our forces to the birth of a new political organisation able to represent our class. Some structured political organisations on the left like Rifondazione Comunista and the PCDI are actively involved in the project. But there are also thousands of young people who have been brought into political activity. Resistenze Internazionali (RI) is convinced of the need to work for the rebuilding of a class alternative in our country, and works to build Potere al Popolo into a such a political organisation – one that is capable of mobilising the 99% of the population in an anti-capitalist battle. We know it will not be easy and perhaps not even possible. Many of those involved limit themselves to illusions in the possibility of reforming this system, demading that the constitution be applied. In some cases, they themselves were responsible for political choices which precipitated the Italian left into the abyss which it currently finds itself in. But whatever the outcome of the elections on 4 March, RI will continue to work in a determined way to build from below a new political organisation which can make our class once more protagonists in the struggle, give struture and organisation to struggles and social mobilisations, link and unify the varied and different forms of resistance to the struggle for a society without prejudice, discrimination and the exploitation of the 99%. For RI, power to the people means a society in which the interests of the overwhelming majority of the population predominate over the private profits of the capitalists. At the same time, national and international big business is very worried about the Italian situation. They know full well that political instability and low economic growth could push the country into a new crisis, above all a banking crisis, which would have European and even international consequences. 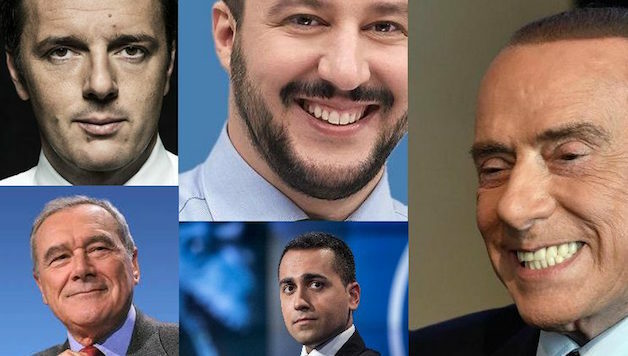 Of the possible government scenarios which could emerge from the elections: a right-wing government involving Forza Italia the Lega and Fratelli d’Italia (Brothers of Italy), a coalition government between Forza Italia and the PD, a M5S-Lega government or technocrartic government, none seem really practicable. The continuation of the economic crtisis, the crisis of leadership of the traditional capitalist parties and the crumbling of the middle class are creating the conditions for a generalised revolt of ordinary people against the elite and the capitalist system. The direction, political content and form that this revolt will take will depend in the last analysis on the presence or absence of a mass anti-capitalist force with real social roots. Resistenze Internazionali is working to build such an organisation. Next articleNine-Cent Wage Rise Sparks Market “Correction” – Are We Headed for Another Recession?